These tarts taste so very good. 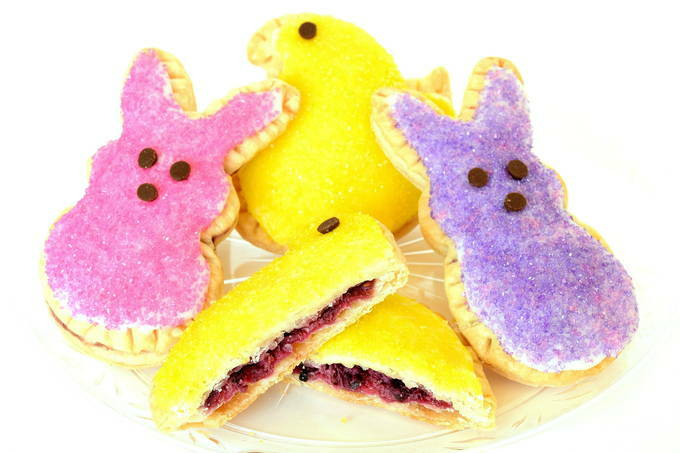 They are made of sugar-sweetened berries, whipped cream cheese, flaky crust, and frosting. And they are super cute! 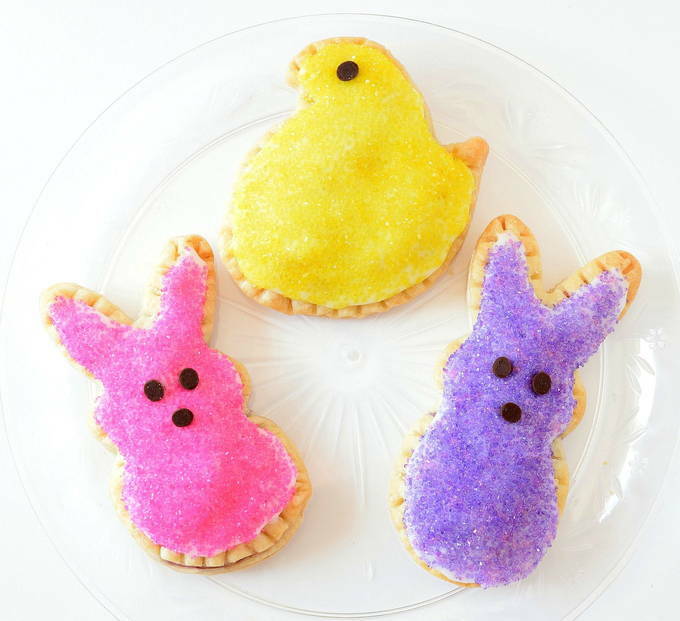 The mini chocolate eyes and traditional colored sugars really give them that Peeps look. When those things come together it’s a real treat. It may look like a cookie from the outside but inside it’s a pastry. The filling is made easily with four different berries – blackberries, raspberries, strawberries, and blueberries. You sweeten the berries with sugar and add whipped cream cheese. The filling is so delicious you’ll want to make more even after you’ve baked the tarts. Making the tarts takes some time so I used a quick premade pie crust. This Pillsbury crust is nice and flaky. 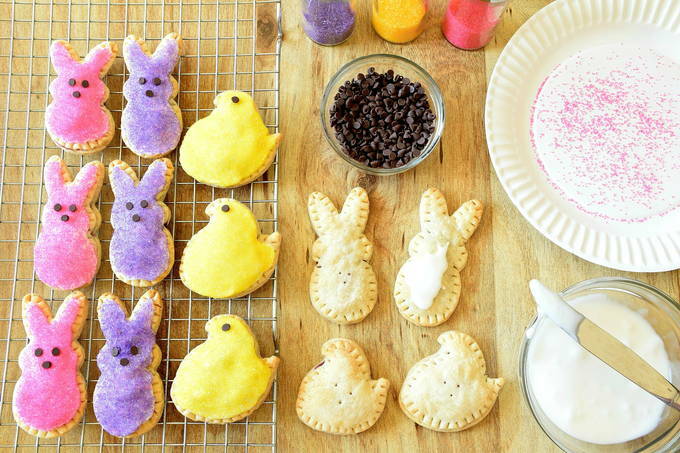 But, you can make a homemade pie crust if you’d like. 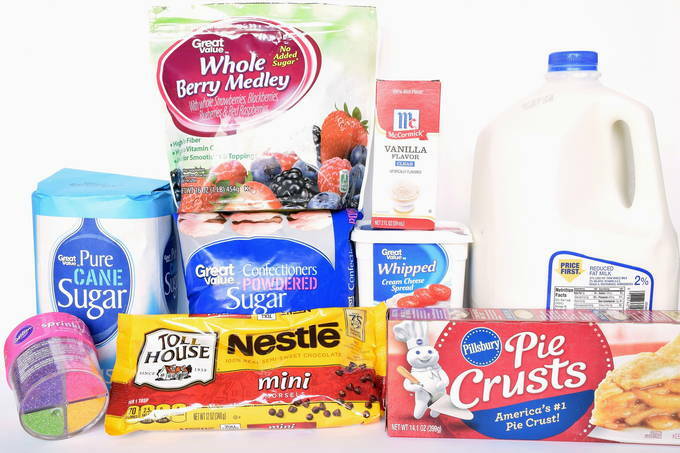 To make these tarts, you’ll need these items. 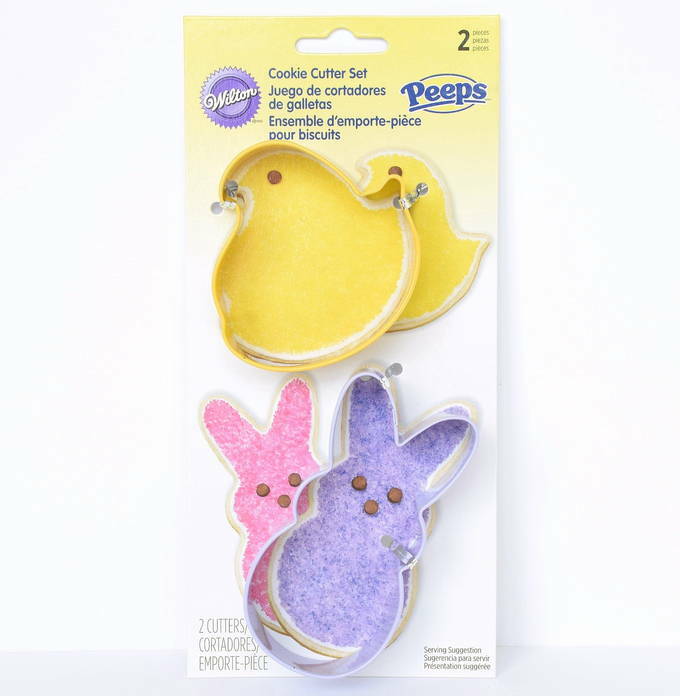 My colors matched closely with the pink and purple peeps (shown on the package below). But the Bright Sugars container had some pink sugar mixed in with the purple. So, check the colors in the container before you buy it and keep it upright. 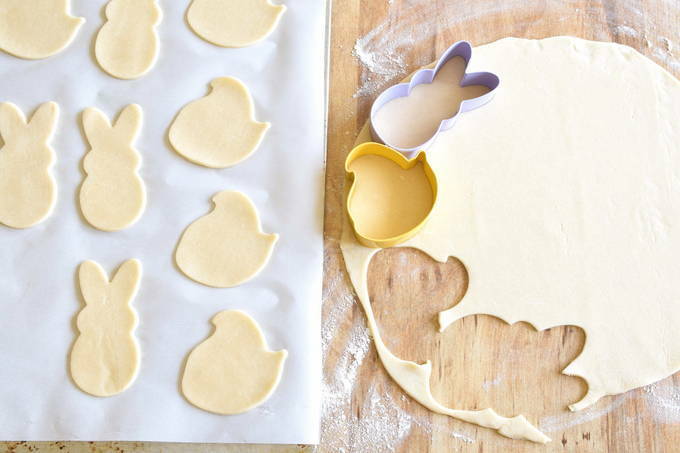 I was so excited to see Wilton’s™ Peeps™ bunny and chick cookie cutter set at Walmart. 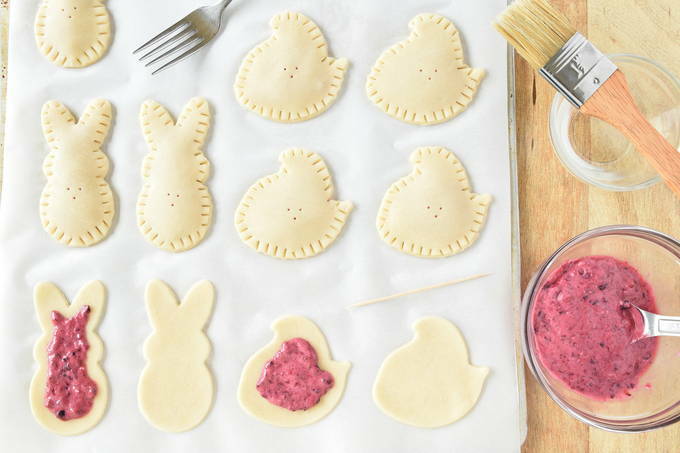 The very first thing I made with them is berry filled tarts. These cookie cutters are colorful and well made. The chick is 2½” wide and the bunny is 4” tall. The tarts were eaten up quickly. 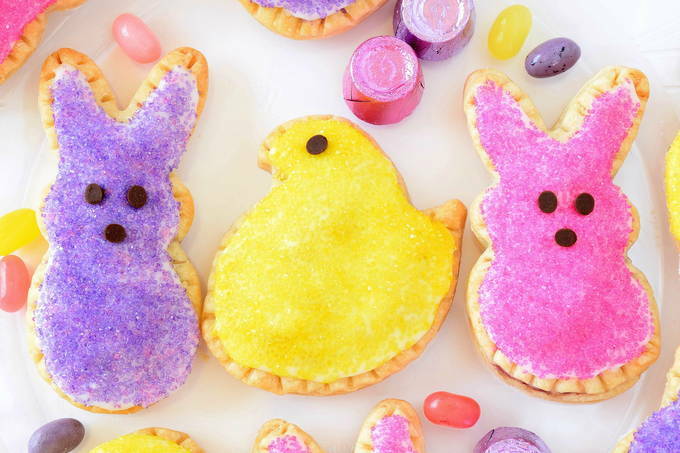 My family will want to eat them year round. The frozen berry medley and filling are so good. I plan to use them in other recipes.